TWO LARGE ERASINGS WILL BE ON DISPLAY. COME SEE WHICH ONES WERE CHOSEN. MOCA GA is thrilled to announce the artists selected for its third installment of the bi-annual exhibition Gathered: Georgia Artists Selecting Georgia Artists. This iteration presents a distinctive examination of the depth of the art of Georgia by presenting fewer participants than in previous years but exhibiting multiple works by individual artists. This year’s esteemed jurors are Masud Olufani, Rocio Rodriguez, and Jerry Siegel. This exhibition features 58 works of art by 36 Georgia artists, selected from over 356 submissions and representing cities across the state of Georgia. Gathered III will be an exciting and thoughtful representation of what Georgia artists are producing. Masud Ashley Olufani is an Atlanta based actor and mixed media artist whose studio practice is rooted in the discipline of sculpture. He is a graduate of Arts High School in Newark, N.J., Morehouse College and The Savannah College of Art and Design where he earned an M.F.A. in sculpture in 2012. Masud has exhibited his work in group and solo shows in Atlanta, Georgia; New Orleans; Louisiana; Chicago, Illinois; Richmond, Virginia; Lacoste, France; and Hong Kong, China. The artist has completed residencies at The Hambidge Center for Arts and Sciences in Rabun, GA.; and Creative Currents in Portobello, Panama. He is a recipient of a 2015 Idea Capital Grant; a Southwest Airlines Art and Social Engagement grant; a recipient of 2015-16’ MOCA GA Working Artist Project Fellowship; the SCAD Alum Artist in Residency Award, Savannah, GA; and is a 2014-15’ Walthall Fellow. He has been a featured actor in numerous television shows and films including Being Mary Jane; Devious Maids; Satisfaction; Nashville; ALL Eyez on Me: The Tupac Shekur Story; The Yard, and he was the on air host of Public Broadcasting’s 37 Weeks: Sherman on the March. Rocío Rodríguez has been in over thirty solo exhibitions in contemporary art centers, museums and private art galleries and she has also participated in over ninety nationally curated group exhibitions. Ms. Rodríguez is the recipient of the Artadia Atlanta 2011 Award, a Cintas Fellowship, an Affiliated Fellowship Award at the American Academy of Art in Rome, Italy and two SAF/NEA Fellowships. Most recently she had solo exhibitions at Kathryn Markel Fine Arts, NYC, Sandler Hudson Gallery in Atlanta, and the Hunstville Museum of Art in Alabama. In 2014 she was awarded an Artist Residency at Marfa Contemporary in Marfa,Texas, where she also had a solo exhibition in July of 2015. She has been commissioned by the High Museum of Art and the Museum of Contemporary Art of Georgia to do temporary large-scale wall drawings in addition to the one done at her exhibition at Marfa Contemporary. In 2012 Ms. Rodriguez had a retrospective exhibition at the Columbus Museum of Art in Columbus, Ga. Her work has been featured in two books; Out of the Rubble and NOPLACENESS: Art in a Post-Urban Landscapeand her work is in numerous national public and private art collections. Reviews of her work have appeared in Art in America, Art Forum, burnaway.org, and artsatl.com. Siegel was born and raised in Selma, AL, and graduated from the Art Institute of Atlanta. He was awarded the Grand Prize of the first Artadia Award in Atlanta in 2009. Artadia is a New York–based national program that awards artists of outstanding merit with substantial, unrestricted funds and connects them to a network of opportunities. His first monograph, FACING SOUTH, Portraits of Southern Artists was published by the University of Alabama Press in 2011, and features portraits of 100 Southern artists. This body of work has been featured in solo exhibitions at 6 Museums in Alabama, Georgia and Louisiana. His next book, Black Belt Color, due in early 2017, focuses his attentions on documenting the unique, cultural landscape of the South, concentrating on the Black Belt region of Alabama. His work has been shown in solo exhibitions at the Ogden Museum of Southern Art in New Orleans, The Museum of Contemporary Art of Georgia in Atlanta, The Telfair Museum, Jepson Center for the Arts in Savannah, GA, Montgomery Museum of Art in Montgomery, AL, The Morris Museum in Augusta, GA ,The Jule Collins Smith Museum in Auburn, AL, and The Mobile Museum of Art , Mobile, AL. A commissioned body of work for the Columbus Museum in Columbus, Georgia, was featured in the 2009 solo exhibition Now and Then, Snapshots of the South. His work is in many private and corporate collections, including the Ogden Museum, High Museum, GA Museum of Art, Birmingham Museum of Art, The Museum of Contemporary Art of Georgia, and many other Southeastern US Museums. SeekATL Visits My Studio, OH MY! Twice per year, many artists submit their websites as "the application" to the SeekATL admin team, they discuss and deliberate. Shortly thereafter, a roster of 5 artists are chosen to have their studios on the SeekATL Tour. This past Saturday, my studio made the tour, OH MY! At the beginning of the Fall and Spring Seasons the list of studios is published and sent to a couple hundred emails of artists and arts professionals in the City of Atlanta. The artists chosen range from emerging to mid career. The first 20 people that respond to the organizer's announcement will be able to attend. Just before the event...the select 20 will receive an email invitation with detailed information about the studio and thus are granted access. SeekATL is an artist group that was established 6 years ago by Ben Steele and Shara Hughes. Artist Brendan Carroll was an active facilitator for a few years as well. 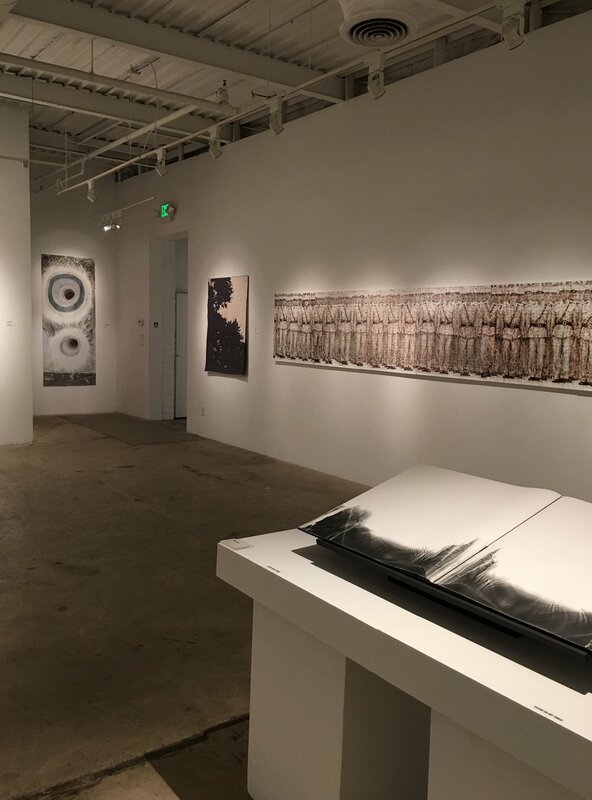 SeekATL connects and creates an ongoing dialogue among artists and arts professionals. It was a honor to share my new Holy Spirit erasings and some old ones too. Thank you all for sharing your time with me. Typically the Orange Coast Review features Southern Californian artists. Having lived there for over 10 years, fortunately I was included despite my new Southern address. The Orange Coast Review is an eclectic convergence of literary fiction, creative nonfiction, poetry, interviews and art. Think of it as a portable salon, a place where boundaries are broken and styles morph, a celebration of creative diversity. One of my erasings was featured from April - May 19, 2016 in the Orange Coast Review Book and Art Exhibition located in The Frank M. Doyle Arts Pavilion at Orange Coast College in Costa Mesa, California. A big thanks to Managing Editor Davi Loren and Art Director Jared Millar. It was a huge honor to participate again for the second year in a row. In May of 2015, this project reached my desk and I jumped at the chance to work with Esquivel Shoes one last time and with Florsheim Shoes for the first time. I was along for their first ever, collaboration. Men known for their craft and their American Heritage brands, it was a daunting task to be sure! I drew many images for this collection and 4 were selected to be in the booklet. A huge, huge honor. With a purchase of a pair of shoes men's or women's, you will receive all 4 of my drawings, only 3 of which you see here! Perhaps that will be incentive to purchase this holiday season. For the first time in 40 years Florsheim is debuting a women's collection! Ladies, it's time to sport some gorgeous handmade shoes.